The native ethnic groups of the Republic of Mordovia are the Moksha and Erzya people. Their languages are similar and belong to the Finno-Ugric group, a sign of their distant kinship with the Finns and Hungarians. Mordovia has a very special cuisine unlike anywhere else, with its unique delicacies. We recommend everyone who comes to Saransk to seize the opportunity to try traditional Mordovian dishes. 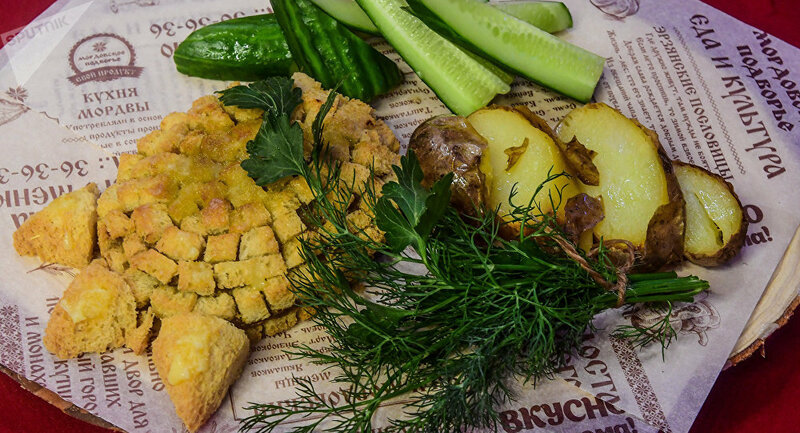 We recommend everyone who comes to Saransk this summer to seize the opportunity to try traditional Mordovian dishes. A local legend has it that in olden times, bridegrooms had to prove that they are true men and that they are worthy of their brides. And so they went off into the woods to hunt a bear and returned with a bear's paw, which they put on the wedding table as proof of their feat. There are very few bears in Mordovia today: the Red Data Book lists them as an endangered species. So the bear's paw is prepared from other ingredients and is not only served at weddings. Here is the recipe: veal liver, pork, croutons and onions are coated with egg, fried, roasted and arranged on a plate to make it look like a bear's paw. It is served as a separate course or with quick pickled cucumbers, baked potatoes and butter. Pork from local breeders and wild boar meat are also very popular in Mordovia. By the way, local woods abound in wild boars. No dinner goes without a poza. This low alcohol beverage is centuries old, so old, in fact, that it was used as an offering to pagan gods. Poza is usually made from sugar beets, which are mixed with yeast and allowed to ferment. Sometimes, rye bread is added and then it really tastes similar to the Russian drink kvass. 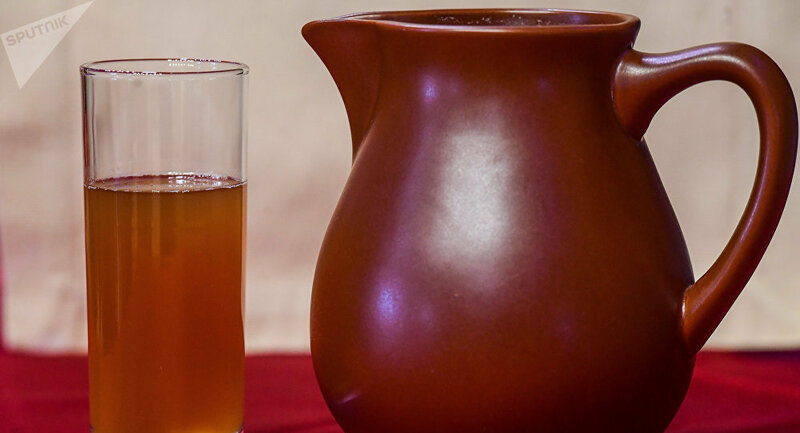 Poza is produced by household breweries that supply it to restaurants of Saransk. The locals believe that good poza cannot be made on an industrial scale. Stuffed pies are the most common food in almost every cuisine, the Russian being no exception. The traditional Mordovian pie is panzhakai with a potato and onion filling. 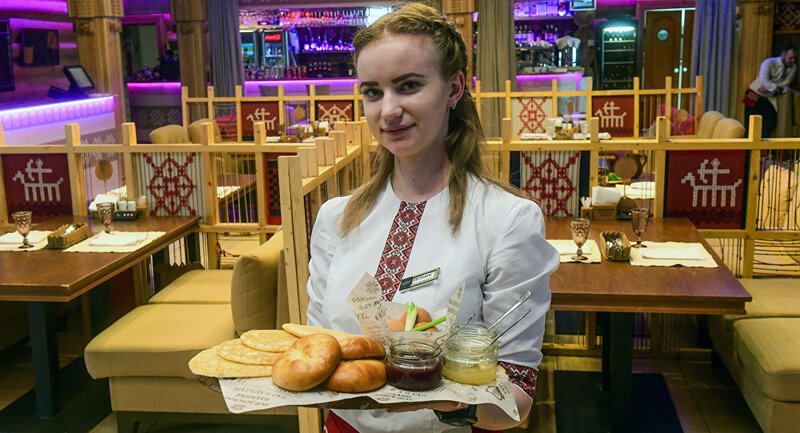 Panzhakais are served as a separate meal or as part of a traditional Mordovian dish, accompanied by baked eggs, homemade jam, honey, sour cream and millet pancakes, all on one plate. For dessert, try pachat, or millet pancakes. Millet flour is blended with milk and yeast. The fermented dough is boiled into porridge and pan-fried. Millet pancakes, thick and hearty, are normally served with jam or honey. Pachat is especially good when washed down with poza, local chefs say.